Substantial and beautiful original Victorian pine panelled door fitted with three long over three short raised and fielded panels fitted with decorative mouldings to one face, and decorative gothic chamfer details. The door is fully mortised and tenoned, and suitable for internal or external use. 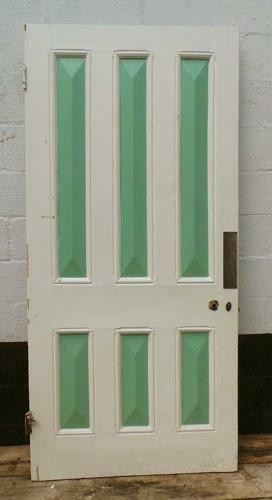 We currently have several examples of this type of door in stock. Please see DB0444, DB0445, DB0446 The door is in excellent condition, but is currently painted. We are happy to strip it at an additional cost. Please note that door furniture is not included in the price.